The pudgy Hispanic boy two driveways over momentarily distracted the robin from his search. After a second’s pause, he returned his beak to the matted leaves in the gutter. There had to be a worm in there. Anything less was a waste of time. Spring was, after all, very short. The boy, facing the street, looked backward over his shoulder, and hefted his basketball up and over his head. The ball disappeared behind him, perhaps into the net. Perhaps not. Leaves jumped to the left and to the right as the bird picked at small sticks and wrinkled candy wrappers. From the car, she watched all of this, while a man in LA told her the day’s economic news through the radio. It wasn’t terribly encouraging news, but the man had a nice voice. 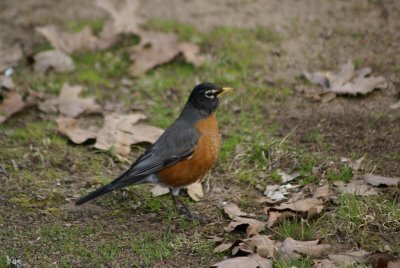 The robin’s instinctive drive to find the worm in the dead leaves was impressive. How could he possibly know that there, in that exact few inch stretch of the edge of the street, would be a fat, wriggling worm? And what made him so certain that he would be able to catch it despite its flipping slippery body? The man in the radio listed numbers from Japan, numbers from Europe, and numbers from New York. The robin, as if he could hear the report, tossed his beak at the very idea. What did he need that information for anyway? He knew exactly where the wealth was, and it was in this pile of leaves. There would never be a shortage of earthworms in his lifetime. There was nothing to worry about. Beneath the surface of the leaves, the worm worked his way deeper into whatever it was he was in. Something like dirt, this particular terrain was stiffer, and smelled of mold rather than the musky velvet of earth. Regardless, he had to keep moving. Not only was he drying out, but the air seemed to be getting closer and closer, and something was making a lot of noise above him. She wasn’t sure whether to cheer for the robin or the worm. If the robin won, the scene would end, and she could go in the house. If the worm won, the bird would fly off, and she’d wonder all night why his instincts had failed him. Both were mildly entertaining. The boy went inside, letting the storm door bang shut behind him. The robin had lost none of his passion. He knew he was getting close. The worm sensed that something wasn’t right, but simply didn’t have the brain power to do much about it other than continue crawling forward. And then it was over. The robin had the worm in his throat, and the man in the radio finished his sentence about the drops in the market. That was poignant enough for Thursday evening, and she went inside to do the dishes and eat left over udon noodles, while trying not to think about how much they resembled earthworms. I loved this! Brilliantly written! Great work, Katie!